Greater Good Radio - Leaders Inspiring Leaders » REBECCA PARKER - President and Chief Executive Officer of M. Dyer & Sons, Inc.
REBECCA PARKER - President and Chief Executive Officer of M. Dyer & Sons, Inc.
Moving is a stressful venture, according to president and CEO, Rebecca Parker, 20-year veteran of one of the largest and most progressive moving firms in the Pacific. It is by taking care of the clients, and not just their belongings, that sets M. Dyer & Sons approach to customer service apart from other players in the industry. With four decades of experience, M. Dyer & Sons has learned how to cope with the stresses of moving incurred to clients, at times offering not just their core services but also empathy and a heart that understands their customer’s situation. Beyond the needs of their customers, M. Dyer endeavors to provide a thriving work environment to their employees, and fulfill a double bottom line philosophy through proactive community involvement. Rebecca’s leadership protracts the company’s deeply ingrained sense of charity. M. Dyer & Sons believes in promoting from within. In fact, all of their upper management staff has climbed from the lowest to the highest rung of their corporate ladder. This philosophy, Rebecca says, provides a better quality base and a clear vantage point to look at their customers’ needs. Years ago, the Dyers developed a succession plan, which eventually resulted to the sale of the company to its employees. Today, the company has approximately 60 employee owners – a unique concept, according to Rebecca, that drives up quality immensely. 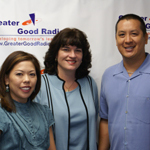 Listen to this interview and find out more about one of the most progressive moving firms in Hawaii and the Pacific, and its leader who relentlessly endeavor to serve the community through business and charity. Rebecca Parker was promoted to President and CEO of M. Dyer & Sons, Inc. in 2000. She began her career with M. Dyer as the in house Accountant in 1986. M. Dyer & Sons provides quality full service relocation services to corporate clients, private families and the Department of Defense in addition to expanding into file records management beginning in 2001. Ms. Parker offers more than two decades of transportation experience with a focus of increasing market share by improving brand awareness in addition to challenging employees to exceed client expectations by focusing on quality, and the expansion beyond the core business. She has promoted employees from within the company as well as focusing on community involvement with a concern for our island environment. Beginning her career in trucking, Rebecca developed an interest in the transportation industry which began in the accounting department but expanded to human resources, sales, risk management, logistics and customer service areas. With her guidance, M. Dyer acquired and developed a freight forwarding subsidiary and a records management division. Overall company revenue has doubled in the past six years. In 1996, Medford and Masu Dyer after 30 years in business sold 100% of the company stock to the employees in an Employee Stock Ownership Plan (ESOP). The success over the past ten years is the result of educating the employees to the value of employee ownership. We instill a sense of pride in providing quality service and pleasing clients which results in an increase in their employee stock value as well as pride in company ownership. The employees of M. Dyer are moving the memories of the relocating family and this takes considerable care and attention to detail. We have implemented a number of employee awards to improve productivity, safety and quality service. Each client has an opportunity and is encouraged to rate their service experience with M. Dyer & Sons. The crews with the highest quality score, receive a bonus. The 2006 survey results reflect a 94% customer service index as superior. As a family moves because of a major life change such as a new job, death, retirement, divorce or birth, the family is already dealing with many personal issues. We train our employees to communicate with care and sensitivity which ultimately reduces the concern and stress associated with the relocation process for the family members. In addition, all employees are on a safety team with quarterly training which has significantly improved our accident frequency and morale. There is a safety bonus program that rewards the teams and all employees as we remain accident free. Ms. Parker also implemented a community involvement program. Most employee owners are serving as scouting leaders, baseball, cheerleading and soccer coaches, and serving with many community non profit associations such as Goodwill, Hawaii Foodbank, Boy’s and Girl’s Club, American Cancer Society, PTA, donating time at homeless shelters, food drives and in church groups. Employees are given time off to serve in the community. We match all employee pledges to Aloha United Way. We have a number of employees serving our country in the Hawaii National Guard. The management team at M. Dyer strongly supports community participation and serves on many industry Boards. Throughout her career, Rebecca developed experience in logistics, client and employee relations, marketing as well as team building and leadership, technology implementation and operations management. Rebecca studied business and accounting at the University of California at Santa Barbara. She has resided in Hawaii since 1979.